Comfortable condo that feels just like home! Winter at Interlaken in June Lake. Tennis courts with a view Walk to Gull Lake. Deck looking out at Carson Peak, perfect for evening barbecues. Entry area with room for fishing poles and skis. Master bedroom with connected bathroom. Master bedroom with TV and electric fireplace. Bedroom with two twin beds and attached bathroom. Master bathroom. Shared second bathroom. Dining room feels like home Dining area by the fireplace. Kitchen with all the cooking essentials. Cozy living area. Two over-sized chairs for extra relaxation. Living Room with TV, DVD player and fireplace. Shared hot tub1 Exterior of Interlaken 1. 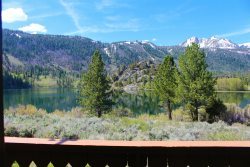 Come relax in June Lake at the Interlaken vacation condominiums. All seasons have something for everybody in this amazing alpine setting. June Lake sits at 7,500 feet and is surrounded by lakes and the stunning Sierra Nevada Mountains. For generations this town has been the perfect vacation destination and it soon it will be yours! Spring comes alive with wildflowers, creatures, and, of course, the start of the fishing season! The trout are plentiful in June Lake, Gull lake, Silver lake, and Grant Lake. Summer offers more fishing, boating, paddle boarding, swimming, biking and hiking! All hiking abilities can hike in June Lake. Take a stroll around Gull Lake or get out in the back country to access famous trails like the Pacific Crest Trail or John Muir Trail. Knowing that only a small group of people get to see the pure, untouched beauty of the back country makes it simply breathtaking. Something else not to be missed is the fall colors in June lake and the surrounding areas. Aspen trees turn to gold and orange which make a stunning backdrop. When the snow starts to fall the June Lake Interlaken Condos are only a two minute drive to the June Mountain Ski Area. This ski area is great for kids, beginners, powder chasers, and back country skiers. Also Mammoth Mountain Ski Area is only 25 minutes away! June Lake is an ideal central location if you want to explore more of the Sierra Nevadas. There is Yosemite National Park, Bodie State Park, Devils Postpile, and the mysterious Mono Lake. At the end of the day come home to your Interlaken vacation condo and relax on your deck watching the sunset over the lake and mountains. Enter this cozy condo and find plenty of storage space even ski racks. To your right is the master bedroom with a king bed, a 32" TV, an attached full bath.. Down the hall is another full bathroom and second bedroom with two long twins. Next is the kitchen and great room which is open with mountain views. The kitchen is fully equipped with a dining table for six, and the great room has plenty of seating. This is the perfect place to gather with the wood burning fireplace, 39" flat screen, DVD, VCR, Cable, various movies and assorted games. There's a comfortable deck with a BBQ off of the great room as well. Three spas in the complex along with tennis and basketball courts, and a walking trail that gives easy access to Gull Lake. Everyone was friendly, informative, and tried to be accommodating. In such a cold weather locale, a hair dryer would be greatly appreciated. It seems like a standard amenity even in the most basic hotel room. Additionally, the beds and sofa beds were not the most comfortable. It would add so much to the vacation experience if the quality of the mattresses were better! My family and I utterly enjoyed our stay. We appreciated the sleds and firewood. I wish we could have made use of the spa, bit didn't have the time. The staff are friendly and accommodating. Excellent service and very friendly. Have stayed there several years now and just love it. The team went out of their way to get us in early. Beautiful view of the lake and wildlife. Easy to get to. Great location to explore the eastern Sierra. The best family vacation we have ever had. Always a pleasure talking with Don and getting his advice on things to do. If we ever need anything, it's handled quickly and efficiently. Communication is essentially round the clock though we never have had to make use of that. If we've arrived later than the office hours, the keys were easily accessed (last year). This is an excellently managed property. This is our third consecutive year staying at Interlaken 1. Our family of four considers it a perfect place to stay when skiing at June Mountain. We also discovered the many summer activities that the area provides as well. Relaxing, comfortable, and quiet, Interlaken 1 is an excellent vacation home and we have already booked for next year. MANAGERS RESPONSE: Thanks for the nice review and we'll see you next year! Unfortunately we didn't have much inter action because we were gone most of the time. More than met our expectations! Very homey and peaceful. We will definitely be back! Always a pleasure, top notch! We have stayed in several of the property's at Interlaken and they have always met our expectations. Great views, quiet and relaxing atmosphere. This was our 2nd year at Interlaken. We worked with Don the year before. This year we worked with Lydia. Both have been excellent. We've already booked for next year. It's perfect for our family. Everyone was great. Lydia is awesome. Excellent accommodations and service. Hope to see you all again next year. Loved the unit. Would like to thank you for arranging the stay for us.